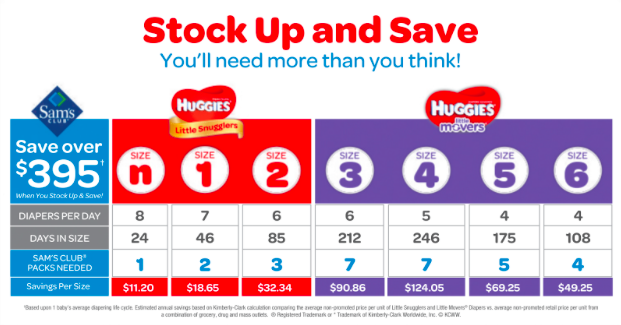 You can click on the image below to learn more about about savings available for Huggies® products. 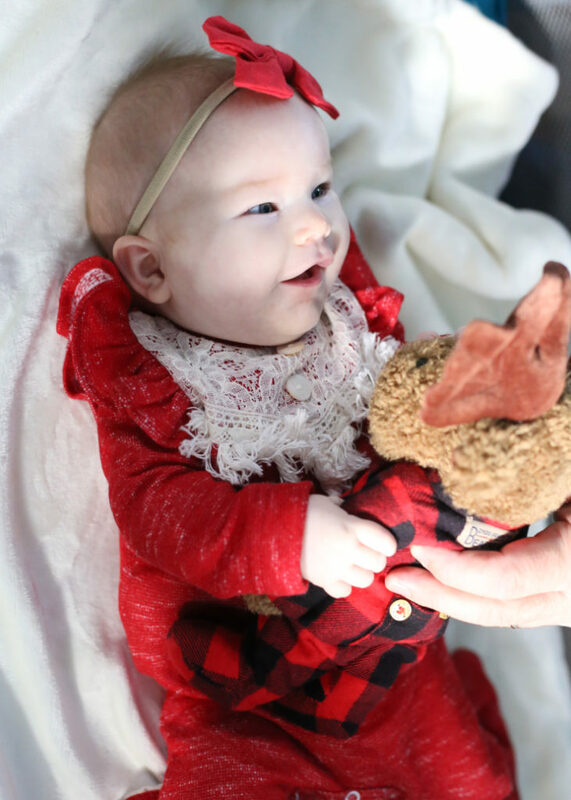 My daughter is 4.5 months and and several weeks ago she learned to quickly flip from her back to her belly. She does it in a blink and she really likes to do it during diaper changes. I can be chatting with her sweet baby face one minute and a naked baby bottom the next. Changing her on the couch or other surface that doesn’t have a secure railing is dangerous. If you don’t have a secure changing table, I advise changing a baby on a blanket on the floor. The most important thing to remember with any diaper changing station is to never leave a baby unattended, not even for a second. Most changing stations are at heights that make it easy for standing adults to reach a baby, a fall from that height could be fatal. 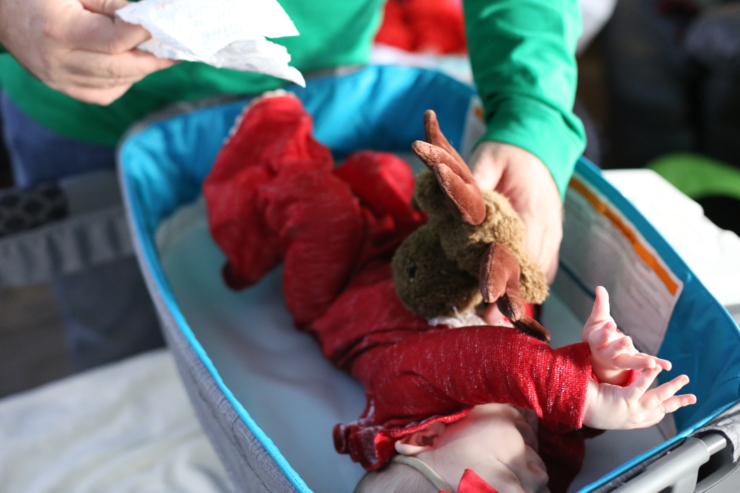 A diaper changing pad with a rail can help improve safety and they can make changing easier. 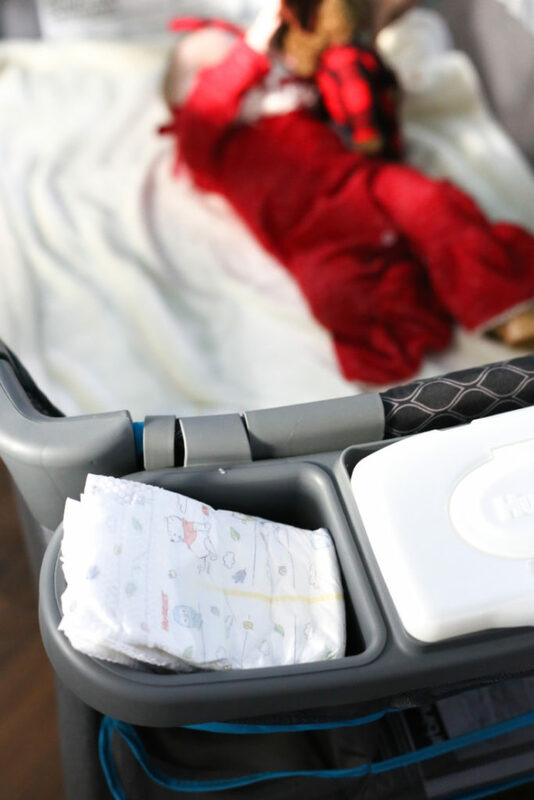 Some specialized diaper changing tables have frames to secure changing pads to prevent them from rolling off. Toys, mobiles and mirrors are great distractions when changing a diaper. A mirror strategically placed on a wall or a reflective mobile can grab the attention of a mobile baby long enough to help diaper changes. You can use a toy as a substitute but you’ll have to ensure baby doesn’t place it in a dirty diaper. 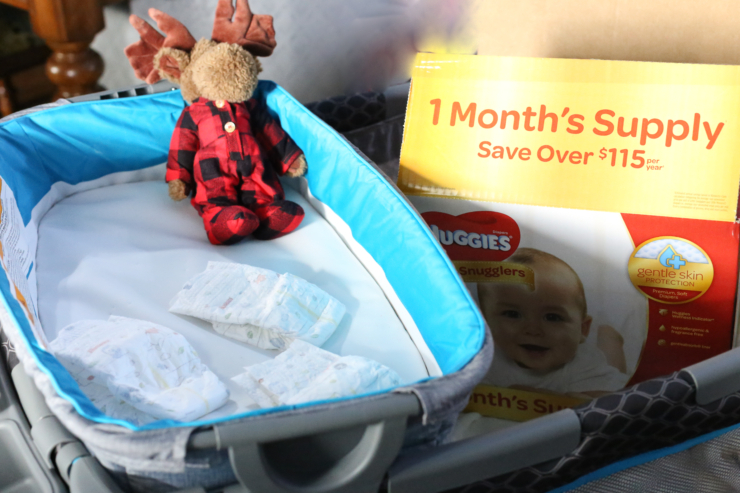 Keep an ample supply of diapers and wipes at your changing station and replenish after diaper changes. You don’t want to have a diaper off and realize that you’re out of diapers or wipes. 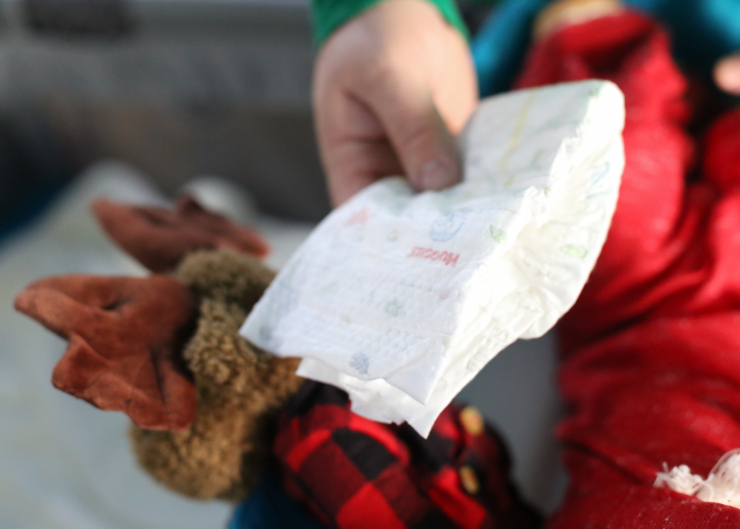 Use notes on your phone or other device to keep track of how many diapers you have left. Running out of diapers at the changing station is bad enough without accidentally running out of diapers all together. We keep several extra boxes of diapers in a spare closet for emergencies. Hand sanitizing wipes and other sanitizers should be stored nearby because diaper changing can get messy. Small hand towels make great barriers to prevent leaks and spills on the changing table. Once my daughter peed on me twice before I could get her diaper swapped out. Remember diaper changing stations don’t have to be fancy, they just just need to be safe, stocked and sanitary. What’s the one thing your baby will wear all day, every day, until he/she is potty trained? It’s important to select a diaper brand you can trust to help protect baby’s skin. 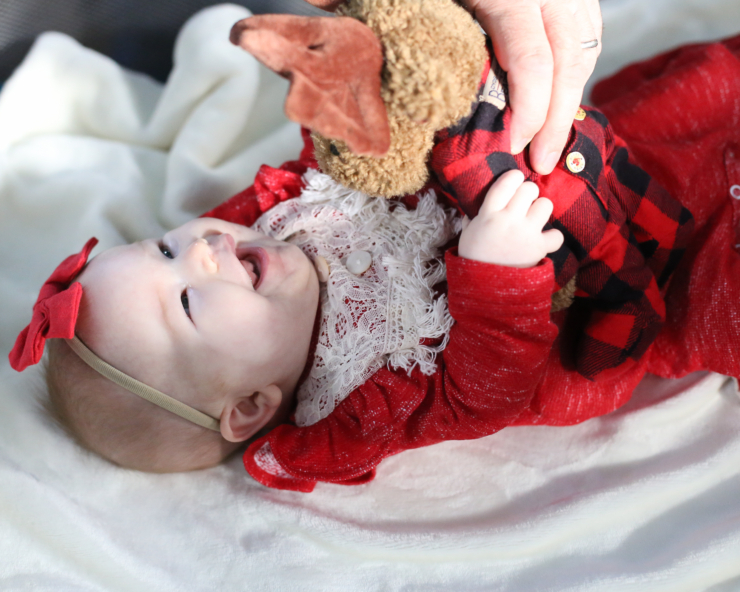 Our family loves Huggies®. We have busy lives. My husband travels almost every week for work and our time together is precious. 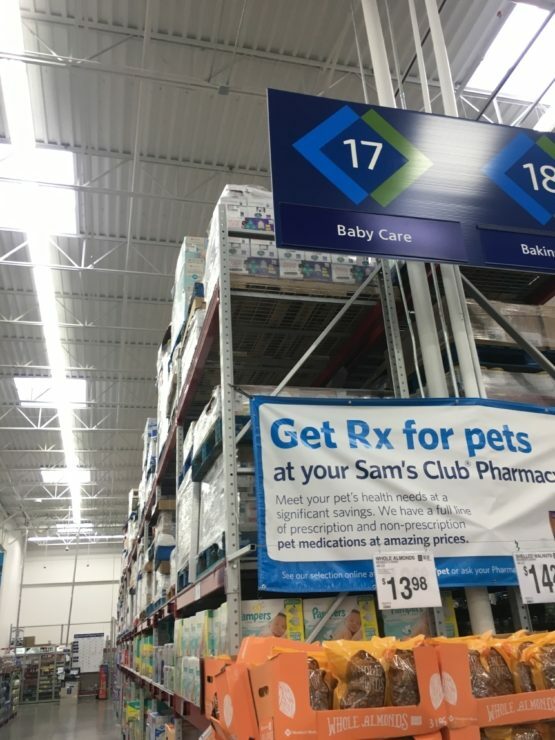 Sam’s Club pick up service and Scan and Go help us spend less time shopping and more time together, while maximizing our savings. 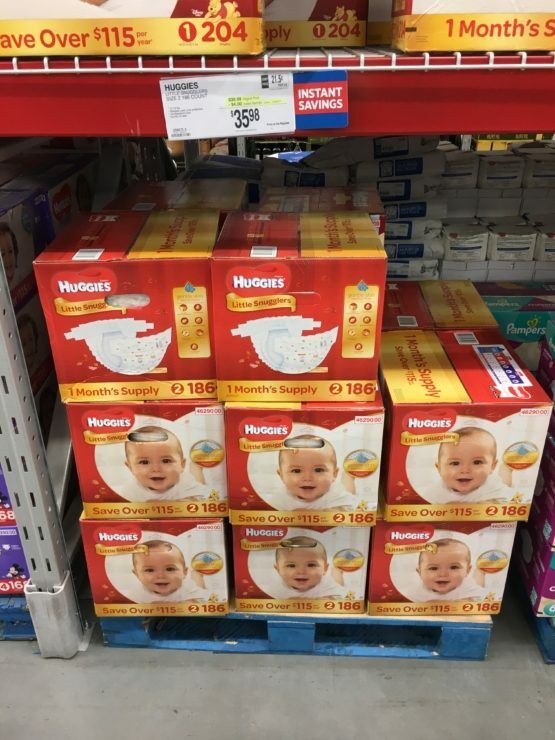 So whether you’re on diaper #1 of 8000+ or you’re buying your very last package, make sure you checkout the savings on Huggies® diapers at your local Sam’s Club.